Well hello…… and happy Wednesday to you!! Most of my sewing time over the last week has been spent working on costumes for my eldest daughter’s upcoming school play, a story of St. Francis of Assisi. A challenge for me as I don’t sew a ton of clothing and when I do it’s mostly from a pattern- except for the occasional scrappy skirt or basic sundress. Anyway, I have certainly been challenged and I am working hard to meet it- my goal is to have four Franciscan monk robes to hand in by the end of the week!!! I have managed to sneak in a few blissful moments of quilting time here and there however. 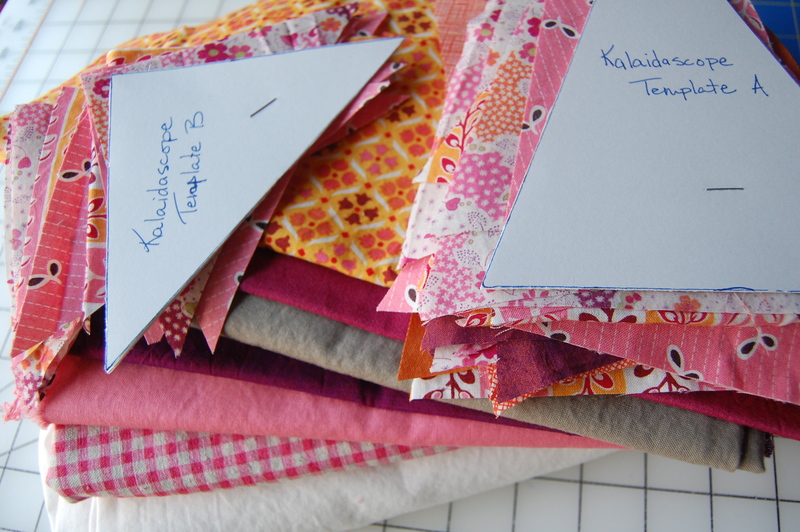 I have decided to start on my first Kalaidascope quilt using Don’t Call Me Betsy’s QAL posts and templates. I’m generally not much of a pattern/template type of quilter, more of a create as you go, intuitive quilter I’d say, but I really love this design so I’m going for it. 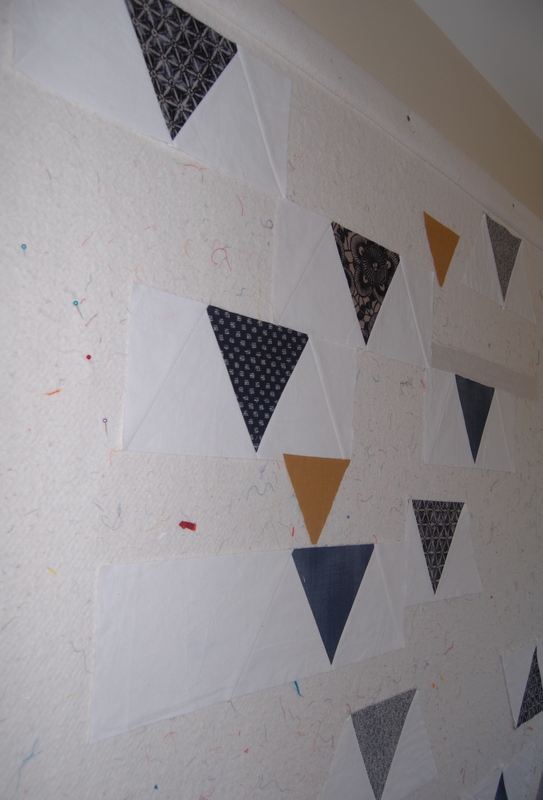 At first I was thinking this would be my youngest daughter’s bed quilt but as I began cutting these triangles, I realized that I simply have no desire to make a twin size bed quilt given the amount of repetative cutting I would need to do. I also just really love adding in bits of my girl’s old clothing to their quilts so I will need to make Miss N’s a bit more “scrappy”. 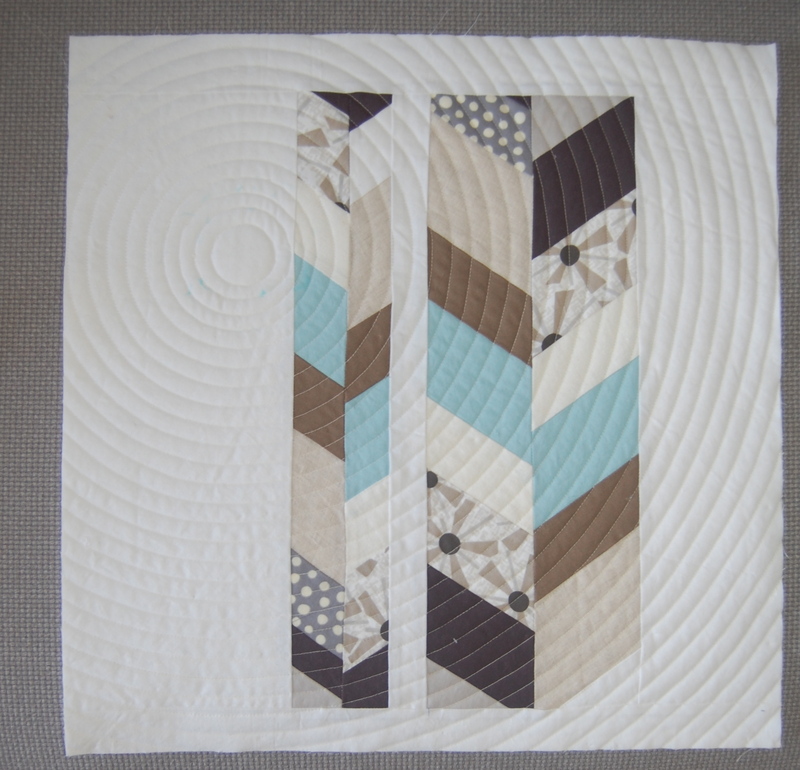 But I am happy and excited to try out a baby quilt size in this design! I also had a big breakthrough on this design that I’ve had up on my design wall for a few weeks. It’s just been staring at me, silent and uncooperative, until the other day, when I came back to it and discovered how to make it work. That is not to say it will be easy and I’m kind of dreading parts of the construction aspect of it, but I’m really excited about the design, I just have to keep the end result in mind as I slave away- Ha, don’t we all have certain moments in the process where we feel that way? I wish there was such a thing as a “modern quilting magic wand”!! And lastly I finished the quilting on my not quite retro design. Not quite retro because it reminds me of another decade, but the 90’s aren’t really considered retro yet…. are they? 🙂 This was a design I was just playing around with as I had strip pieced these colors together a long while ago and decided I didn’t love them. I recently found them and started experimenting with some herringbone/chevron designs. I didn’t really have enough for a whole quilt and didn’t love it enough to commit to that anyway, so pillows they are destined to be. I can get two 18 x 18 pillow covers out of them. It was a good chance to practice my concentric circle quilting…… so easy and quick on these smaller pieces. I love your herringbone (soon-to-be) pillow! Really, super love. And good luck on your monk robes! Have a great day! lovely projects, Karen. And wow!!! making costumes must be a lot of hard work. I totally know what you mean about the magic quilting wand. I want one too. I tend to get really excited about seeing my quilt tops finished that I just jet to the end, like when you are reading a good book. My biggest problem is when I lose momentum and then it just sort of stops… I love these triangles and can’t wait to see your finished top! I need a design wall…it is helpful to see pictures of yours, and how that helps in figuring out the construction. I think the “how do you put that together?” has stopped me from attempting something more modern and less structured. Thanks!